Charlotte Mason wrote extensively and helpfully on the teaching of math. You will find much ease in your labors from first carefully reading and pondering her insights for teaching math in Volume 1, pages 253-264, and Volume 6, pages 110-112; 151-152; 230-231. There are also Parents' Review articles that address math (listed at the end of this page). We encourage you to initiate discussion of these passages with the friendly and experienced members of the AO and CM Series Yahoogroups, among whom there is an astonishing wealth of wisdom and experience in teaching with CM methods. There are many good math programs available to homeschoolers. When selecting the best fit for your family, you will want to consider your own math proficiency, and how much time you can realistically devote to teaching math every day. Those who enjoy teaching math often prefer programs that require more teacher involvement, such as Right Start or Miquon Math. Those who prefer programs that are less teacher-dependent also have excellent options, such as Teaching Textbooks or Math-U-See. Right Start Mathematics -- Based on the abacus; teacher-intensive. Favored by many CM teachers. For grades 1-8. Teaching Textbooks -- An interactive program using CD-roms and an optional text; virtually self-teaching. Also a favorite among CM teachers. Elementary levels through Pre-Calculus. Math U See -- Teaching videos, manipulatives and consumable texts. Miquon Math -- Based on Cuisenaire rods; very kinesthetic. Teacher-intensive (teacher materials can be confusing, but there's a yahoo support list). For primary grades. Ray's Arithmetic -- Historical, no-frills set of books for grades 1-8; recommended by Ruth Beechick. These are the texts used in US schools in the 19th and early 20th centuries, and the computational skills are advanced compared to modern math texts. Lots of word problems; develops strong mental calculation skills. Affordable; very teacher-intensive. There is a yahoo support group. Singapore Math -- Uses methods that have helped Singapore obtain high international math scores. May need supplementing with another math program. MEP (Mathematics Enhancement Programme) -- A free math curriculum from the University of Plymouth in Great Britain. Download the practice books, lesson plans, and answer keys (for upper years) through the University website. 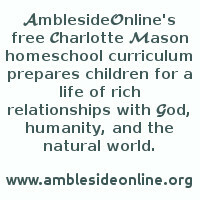 Password required for use of some portions of the site, but homeschoolers in the US have had no problem obtaining one when they ask. MEP has an email support group. Math Mammoth -- Affordable downloadable math books. An Easy Start in Arithmetic by Ruth Beechick -- An inexpensive pamphlet packed with teaching wisdom for grades 1-3. Highly recommended and widely available. Seashell Math by Lynn Hocraffer -- A helpful model for teaching multiplication using CM methods, by the leader of the original Charlotte Mason listserver (now the cmason yahoogroup). Living Math by Julie Brennan-- math resources with a CM focus. Roman numerals charts are available at YourDictionary, RomanNumerals.co and wisegorilla. Monopoly money - Prints ten bills per sheet, which can be used to practice counting money. Read Any Good Math Lately? by David J. Whitin and Sandra Wilde -- a great source for books that incorporate or illustrate math concepts, especially in the early years. Games for Math by Peggy Kaye -- A book of fun and effective math games using household objects; for grades K-4, approximately. Note: Math programs generally follow either a mastery formula or spiral formula. In spiral programs, skills are cycled through lessons for review over multiple years, which is fine as long as the skills are truly mastered when they cycle through the lessons. When selecting a math curriculum, and when planning how you will assess skill proficiency with that curriculum, it is helpful to know from the start whether it is a mastery program or a spiral program. Mastery vs Spiral and here. Harold Jacob's Elementary Algebra, Basic Geometry and Mathematics: A Human Endeavor published by WH Freeman -- Classic texts that are highly rated for being engaging, thorough and yet accessible; a review here. VideoText -- DVD program for Algebra and Geometry; recommended by Dr. Jay Wile. Teaching Textbooks -- CD-rom courses for Algebra, Geometry and Pre-Calculus. Preferred by many over VideoText; recommended by the Andreolas, Cathy Duffy, Sonlight and others. Purple Math -- Free online algebra. The Math Page -- Free online courses in arithmetic, Euclid-based plane geometry, and algebra, as well as topics in trigonometry and calculus. Khan Academy -- Free video lessons in math and science. The Teaching Company courses -- They offer a wealth of courses that make math come alive. Euclid's Elements -- The historic, standard text of classical geometry. Notes of Lessons has a sample math lesson. Thanks to Amy Raab for her help with this page!